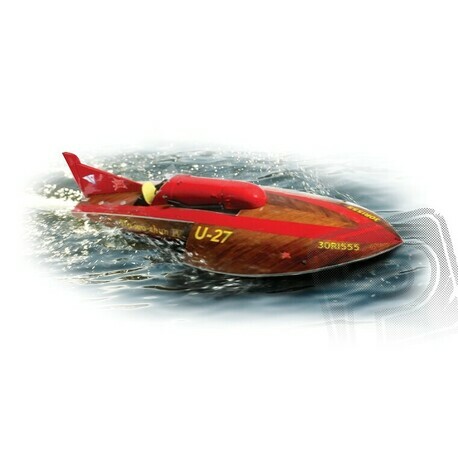 A detailed sophisticated RC model of a 750-mile American historic speedboat with a wooden plated fuselage from the Danish company Billing Boats. Kit in scatter on scale 1:12. Racing speed boat with the sprightly named Slo-Mo-Shun IV (which is pronounced like Slow Motion - Slow motion) was built in Seattle in 1949. In the bowels of a small wooden boat was hiding Allison V-1710, which must be powered fighters Airacobra P-39 or P-40 Warhawk. From 1950 to 1953 three times won the prestigious Golden Cup (sister boat Slo-Mo-Shun V additionally won in 1952 and 1954). In 1950, Stanley him Sayres set a world speed record speed of 258,015 km / h; two years later he reached even 287,263 km / h - a record that surpassed to Donald Campbell Bluebird K7 on a jet engine. Kit in 1:12 scale is designed for moderately advanced ship builders. Slo-Mo-Shun IV has a hull design with classic wooden picket hull, wooden deck and superstructure. The kit includes all the plastic and wooden parts needed to complete the model, dummy accessories, marine shaft sleeve and the propeller. To drive model includes a DC motor or a corresponding 700 series brushless motor, at least 50 A bidirectional controller (depending on engine) 7 link chain or NiMH 2-3S LiPo battery with a capacity of 3 to 5000 mAh. To drive, you can also use an internal combustion engine 2-2.5 cc. For basic operation is sufficient even the most ordinary two-channel radio system; to control the rudder servo meet the current standard.